Please click the ‘Login’ tab below to log-in to access your account. If you forget your password, please click the ‘Forgot Password’ tab below. Once you enter your email address, an automatically generated link will be emailed to the address that you used upon registration that contains instructions on how to reset your password. For additional questions, please consult the FAQ page. The FAQ can be found by clicking ‘FAQ’ at the top of this page. If you require additional assistance, please contact ceinfo@acpe-accredit.org. SUBSCRIBER, by subscribing to the Webinar, understands and agrees to the following terms and conditions: 1. 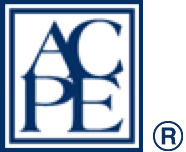 ACPE has a proprietary interest in and a copyright for the Webinar and a registered trademark of the ACPE logo. SUBSRIBER acknowledges the validity of the proprietary interest, the copyright and trademark and agrees not to take or permit any action to be taken that would violate, compromise or dilute ACPE’s interest in the Webinar or ACPE’s proprietary interest, its copyright or its trade mark. 2. The copying or reproduction of the Webinar in electronic, magnetic, digital, manual or any other form or format is strictly prohibited. 3. The Webinar may not be displayed, posted, or broadcast and may not be shared with or otherwise made available to any pharmacy or other continuing education provider, any third parties or the public. 4. The Webinar will be available for one year following the purchase date. 5. ACPE reserves the right to change the content at any time. 6. The Subscriber is responsible for any violation of any of the restrictions or conditions. 7. The Subscriber will pay the designated fee. If subscriber chooses to terminate their subscription prior to their expiration date, the webinars are non-refundable.